Happy New Year from Lark & Lola! 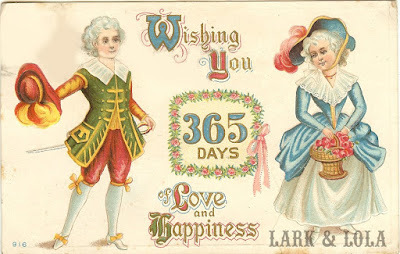 We wish you 365 more days of love and happiness, just like my adorable vintage postcard says. I thought it'd be fun to share some history behind the "Auld Lang Syne" song and what that means, in case you didn't know. Auld Lang Syne was a Scottish poem written by Robert Burns in the late 1700's and was set to a traditional folk tune. The translation of 'auld lang syne' basically means "long long ago" or "old long since" and is pretty much eqivalent to us saying "Once upon a time". It's a pretty sentimental poem when you read the words to it. The word syne is pronounced in American English like the word 'sign'. It wasn't originally written to be a New Year's traditional song, but it did become a sentimental tradition to the holiday over the years. In Scotland, however, the song is usually sung at the end of a dance, when friends join hands and come together for one last song.